With the first decade behind me, I was feeling more confident in my understanding of how to improve surfing performances. Of course any improvement process is a shared process, and those surfers who really wanted to excel – took on board what needed to be changed, did the work necessary, and with extra support through training camps and competition-day support, my surfers started to win and win often. I also became more motivated to share my knowledge through product development. My philosophy was to produce useful instructional products, and through them, effectively coach people I would never meet. Feedback and generous comments by numerous purchasers of those products over the years have confirmed that they have indeed helped many surfers from around the globe improve their surfing. 1. 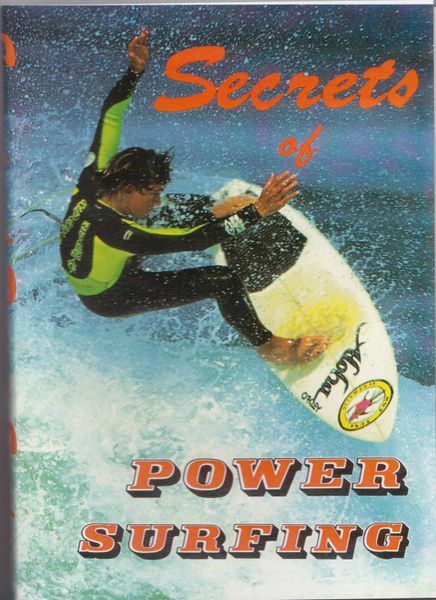 Secrets of Power Surfing: “Secrets of Power Surfing” was my first instructional video that described the surfing technique of the major manoeuvres. Bottom turns, re-entries, cutbacks, floaters, snaps, and finishes. I tried to use footage of good surfing to highlight how those manoeuvres should be performed, in a way that flowed like a normal surf video. It was important from my perspective to keep the production moving, so that surfers didn’t get bored by too many stoppages throughout the video. That way, I hoped people would be happy to watch the video a number of times, and with each viewing, more of the information would sink in. In the end it did sell over a 15 year period, and I got it translated into Japanese and sold quite a few copies over there. It also sold on the east coast of the United States, although I don’t know who was selling them nor did I receive any dollars from that pirate. 2. 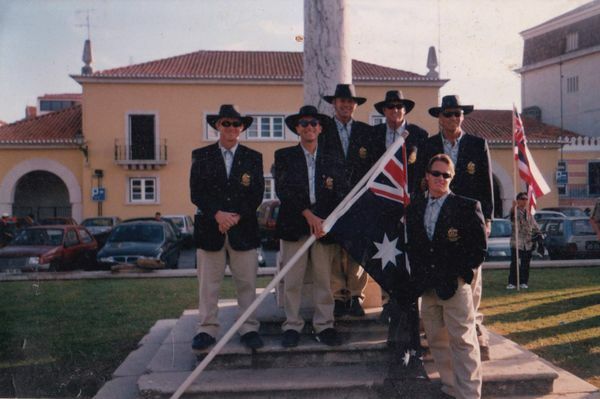 Australian Team Coach: In 1998, I was invited to be one of the Australian coaches for the World Surfing Titles in Portugal, along with Paul Neilson and Wayne “Rabbit” Bartholomew. I suppose I was invited because of my work in New South Wales over the past decade, but also the surfers I was coaching at the time were doing really well, winning contests throughout Australia, and internationally. It was a great experience and of course, Australia won the gold medal. 3. Ben Dunn: My son Ben stated surfing around 5 and by the time he was 18, he won every titles there was to have. 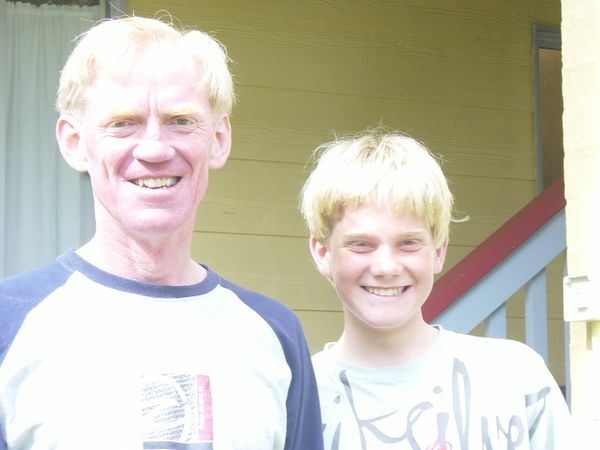 His early surfing experience was surfing with numerous surfers who went on to WCT qualification, as many came to our training camp in Old Bar, NSW. Ben was the little grommet in the corner watching and absorbing what was being said, and actually developed more through a process of osmosis. The rule with Ben when he was young was that if he was surfing with surfers I was training, I would film him if no one else was up and riding. Years later I discovered a number of VHS tapes where he had copied off his footage from all those training sessions. He had manufactured training videos for himself, and was downstairs watching, learning, and moving ahead with his surfing – basically driving his own boat. 4. Ben and Jessi: Among the hundreds of surfers I trained during this decade, Jessi Miley-Dyer was a classic. She used to train with her good mate Rebecca Woods on a regular basis over a number of years. There is even a wave at Old Bar I call Jessi’s left, cause she preferred to surf it whenever she could. Jessi along with Rebecca, qualified for the World Championship Tour and she now is the current Women’s Commissioner for the World Surf League – the governing body of Professional surfing. The thing is, that for the period 1998 – 2004, if Ben won a major junior event, Jessi won the equivalent women’s division. They were both pretty much unbeatable in Australian junior surfing during this period. 5. NSWIS: Before the 2000 Sydney Olympics, Surfing NSW was awarded a multi-year funding grant from the New South Wales Institute of Sport to develop our top junior surfers. This was a big deal, as surfing had got no financial support from any government body, state or federal up to this point. We were seen as a fringe sport, although NSW surfers were dominating Australian and International surfing at the time. I was asked to co-ordinate and lead the program, and with the help of coaches Matt Grainger, Dave Zeman, Jon Vine, Dave Clarke [Strength &Conditioning], and Shona Macindoe [Physiotherapist]. Besides the fine work of the coaches, Shona in particular, worked tirelessly to treat the surfers when on the road and fixing any overuse injuries. The squad was a virtual who’s-who of future WCT surfers from NSW. Darren O’Rafferty, Tom Whittaker, Adrian Buchan, Micro Hall, Shaun Cansdell, Chelsea Hedges, Samantha Cornish, Jessi Miley-Dyer, Rebecca Woods, Amee Donohoe, with others from the squad becoming well respected surf coaches in the years to come. 6. Old Bar Training Camps: Trish and I bought an old house in Old bar, re-modeled it, and turned it into a Bed & Breakfast / Surf camp. 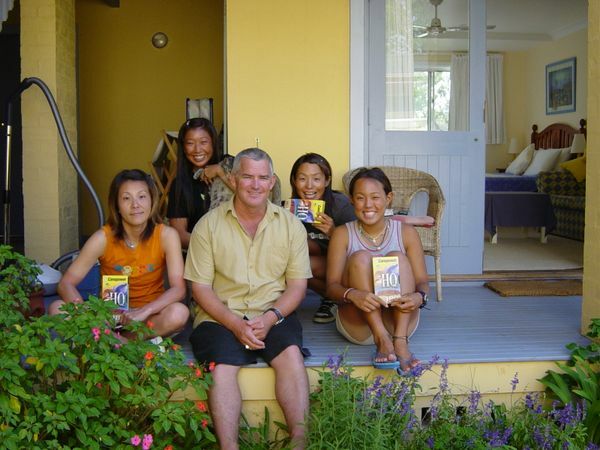 At the start in 1998, our customers were 80% traditional Bed & Breakfast customers and 20% surfers. At the end of our tenure in Old Bar- 15 years later, those percentages had reversed. The thing about Old Bar for a training base is that the locals are great people and there isn’t much of a crowd. So for training purposes, it was ideal to conduct quality training with high quality and motivated surfers. My camps usually lasted for 2-4 days, where we trained, ate meals together, and got to know each other. I have always preferred this type of training arrangement, rather than just meeting surfers each morning with little interaction outside of training hours. Every surfer who trained with me went away with a “focus video”. These videos contained their surfing footage from the camp and I usually highlighted 2-6 skills [depending on their needs], that they needed to work on. The surfers then had a video they could watch before surfing at their home beach whenever they felt the need. These thousands of “Focus videos” that I have created for surfers over the years were the forerunner of my “Video Analysis” service I currently offer through my website. http://www.martindunn.com.au/surf-better/ Understanding what an individual surfer needs to do to improve, is the first step in any development process. My video analysis service is a great first step for any motivated surfer. 7. Mentor – Rob Hawker: In the early 2000’s I started training New Zealand surfers Leigh, Ben, and Ryan Hawker from Piha Beach, on the west coast of Auckland. 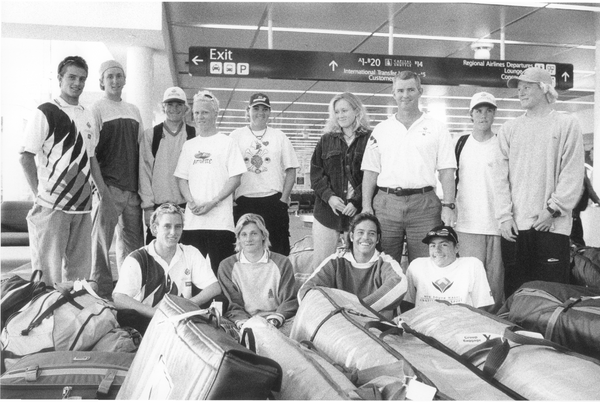 All really good surfers, and it was the start of a number of years travelling to New Zealand to coach different groups of surfers. Besides being where Middle Earth is situated, New Zealand is a great place and I have always enjoyed my trips there, the surf I have seen, and the people I have met. Rob, the Hawker boy’s father, was always willing to share his knowledge and experience in how businesses are organized and was invaluable to me when I was setting up my former website Surfcoach.com. He is a switched on guy who generously endowed me with the information and knowledge I needed to successfully launch Surfcoach.com. 8. 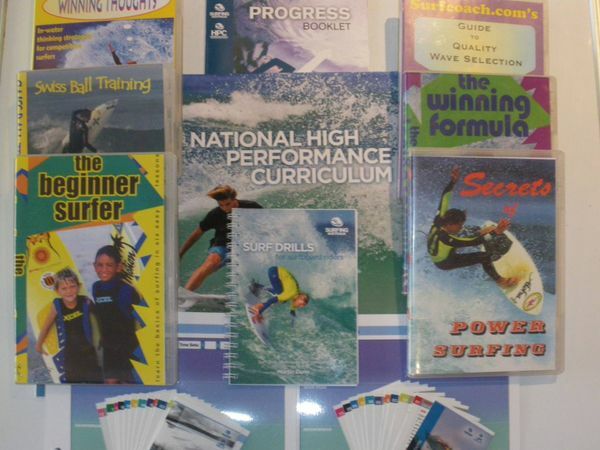 Instructional Products: By the end of this 2nd decade, I had produced 12 instructional products that I was selling to my surfers, parents, or via the web. Besides coaching surfers I would never meet, an outcome of this body of work was that I was beginning to be seen as the expert in how to train surfers. This reputation attracted a lot of coaching work, both with surfers coming to Old Bar to train and for me travelling globally to train groups of surfers in their own country. 9. Surfcoach.com: In the early 90’s the internet was just coming online and I created my first website called Ripstix.com.au. Ripstix was more of a “shop window” into what I did – training camps, and instructional products. If I got an enquiry from around the globe, I could direct potential customers to the site for more information. Because of the power of the internet to distribute information, I had been thinking about creating a more interactive site for many years, then in 2006 I stated working on Surfcoach.com. I built “Surfcoach” fundamentally between 2 am and 7am over the course of a year, as I had coaching work during the days. Designing the site and creating the videos, although a lot of work, was one of the most enjoyable things I have ever done. 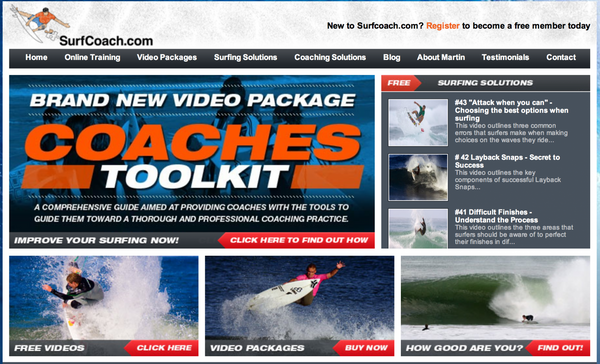 After much deliberation, I sold “Surfcoach” to Surfing Australia in 2010, and today 80% of the videos on the site are still my original videos that went online when the site launched. They are still helping surfers globally better their performances. I’m stoked. As a result of the sale of the site, I have nothing whatsoever to do with the site now. 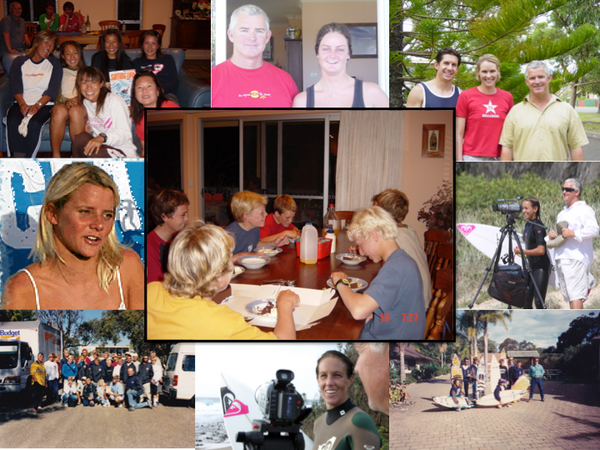 I coached so many fine surfers from around the globe during this decade, far too many to mention. It was always an absolute pleasure, with them teaching me as much as I taught them.